We recently made some cosmetic changes to our home office and I couldn’t be happier. 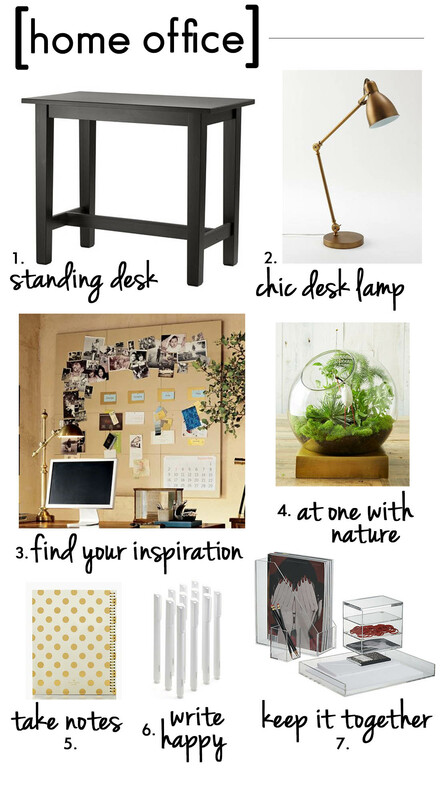 A personalized work space helps keep you motivated, spurs creativity and it really just makes working more enjoyable. You may notice the desk in the image above is a standing desk (well it’s actually a bar table). My husband first brought the standing desk phenomenon/trend to my attention after reading article after article about how sitting for hours on end is hazardous to your health. He read this one article in which experts proclaim that standing on weekdays burns calories like running 10 marathons per year. Crazy, right? I did some research of my own. Sitting for more than 6 hours per day is really bad. How bad you ask? Your risk of heart disease increases by up to 64 percent. Also, you’re shaving off 7 years of quality life and it puts you more at risk for certain types of cancer. Ugh. To sum it up, humans weren’t meant to be sedentary. While I don’t have any of the chronic conditions listed above, I am aware that I have terrible posture while sitting at my desk all day. This illustration from the Washington Post shows what happens to our body after sitting all day and what you can do to help combat the effects on your body. As difficult as it may be to peel ourselves away from the computer, it’s super important to get up and move around throughout the day. What do you think of standing desks? Could you stand at your desk all day?